Fort Worth Texas Defensive Driving - Comedy Style! Take your course today for only $25.00! Defensive Driving - Faster and Easier Than Ever! You would think, driving the same way to work every day, that you would know all of the favorite hiding places of those guys with radar guns but, NO. Now you're the proud owner of a shiny new City of Fort Worth citation. How are you going to get it dealt with on a busy schedule like yours? There's a chance that you remember taking defensive driving in the past, back when you had to drive to a classroom just to sit and listen for six mind (and backside) numbing hours. With ASenseofHumorDriving.com, those days are gone! Now the driving school doesn't dictate how you're going to spend your Saturday, you decide when, where and how you complete your course. - With FREE audio, we even do the reading for you! When you like, where you like, how you like. Sounds pretty good so far, doesn't it? 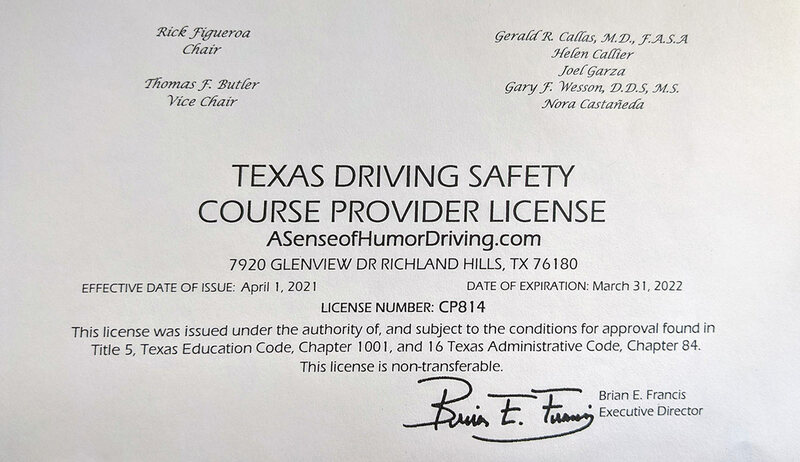 In Texas, state law extends drivers the opportunity to dismiss a traffic citation once every 12 months by taking a defensive driving course. It is important to note that the court will only dismiss your ticket if the course you choose is entirely state approved.  Our course has met all the requirements for state certification required by the Texas Education Agency (TEA) and the Texas Department of Licensing and Regulation, so no worries. The certificate you will receive from us will work for you, no matter where in our great state you got your ticket. Our course is also 100% approved by the Texas Department of Insurance. When you receive your course completion certificate, it comes with two copies. One, of course, is for the court. The other might just put some money back in your pocket. Many auto insurance companies will offer policyholders a discount on their premiums for having taken a DOI approved course. We have many students who take our defensive driving course just for the insurance discount. Check with your agent. That second copy of the certificate may not just pay for the course, it might take care of all those nasty court fees as well! While keeping tickets off of your record and saving money are both good things that come from taking a defensive driving class, here's one more thing to also consider. Studies have shown that in the 12 months following the completion of a defensive driving course, drivers have fewer accidents and suffer fewer injuries than drivers who have not taken one. We think keeping you and your car in one piece beats keeping a ticket off of your record any day. We know that when the court approved your defensive driving course that the clock started ticking. We're not going to make you wait for that certificate of completion. As soon as you finish your course, we will process your certificate immediately and, if you finish by 3 PM, it will be mailed to you the same day. Need it sooner than standard mail? We have a number of affordable expedited delivery options available for you to choose from. By the way, if the judge asked you to submit a copy of your driving record, we can get you a copy of yours in a flash. We did our best to design our course to be as user-friendly as possible, but you may still have a question or two along the way. No matter the question, we're here to help. A trained and talented team of Texans is waiting to give you a hand from 9 AM to 9 PM on weekdays and from 9 AM to 7 PM Friday, Saturday and Sunday. Give us a call or shoot us an email. We love to help! Online Defensive Driving with A Sense of Humor! You probably got that ticket because the officer knew you needed a laugh!